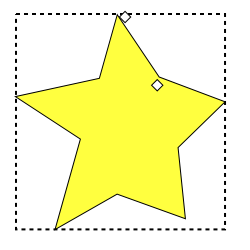 The Star Tool can be used to draw regular polygons and stars. To draw one of these objects, select the tool by clicking on the icon (Shift+F9 or *) in the Tool Box. To draw a polygon or star, use a Left Mouse Drag. 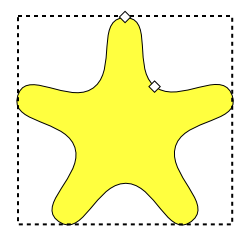 A star will be drawn with the center at the starting point of the drag and one vertex at the ending point of the drag. The vertex can be forced to be at a multiple of the Rotation snap angle (15 degrees by default) by holding down the Ctrl key during the drag. Stars can be reshaped by either dragging handles (small diamonds) on the star or by using the settings in the Tool Controls when the Star Tool is selected. Two important parameters can only be changed in the Tool Controls. The first is an option to specify that the shape drawn be a star or a polygon. This is controlled by two toggled buttons ( and ). The second is a parameter that controls the number of points in a star or the number of corners of a polygon. There are two handles for stars (one for polygons). The Tip radius handle (see the Notification Region if in doubt which is which) is used to control the position of the tip of a star or corner vertex of a polygon. This is the handle that was used when first drawing the star or polygon. Using the Ctrl key while dragging the handle restricts it to a radial line. 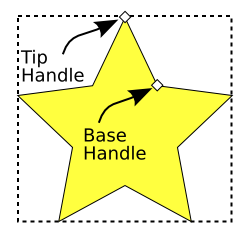 A star showing the Tip radius and Base radius handles. 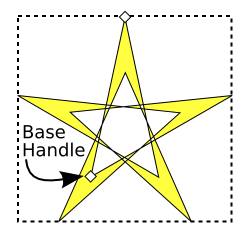 The Base radius handle controls the position of the “inner” vertex of a star. The Base radius handle can be constrained to have an angle halfway between adjacent tips by holding down the Ctrl key while dragging it. Note that it is possible that the radius of the Base vertex be larger than the Tip vertex or it can be negative as shown next. A star with a negative Base radius. Holding the Shift key while dragging either handle will round the corners of the star or pentagon. A star with rounded corners. Holding the Alt key while dragging either handle will move all the star's or polygon's vertices independently in a random fashion. A star with a random factor added. As mentioned above, the Tool Controls area contains entries to determine if a star or regular polygon is drawn and to set the number of points or vertices. For stars, it also contains a box to set the Spoke ratio. This is defined as the ratio of the Base radius to the Tip radius. Useful values are: for a regular 5-pointed star, 0.382; for a regular 6-pointed star, 0.577; and for a regular 8-pointed star, 0.541. Numerical values for Rounded and Randomized can also be entered (try −10 for Rounded!). And lastly, there is a Defaults button ( ) to reset all of the settings to their default values.